Farmhouse, Single Family - Charleston, VT An unspoiled 1608 acre slice of Vermont can be yours as owner of Mount Bess Farm, an ideal place to escape and enjoy nature, wildlife, mountain views, and star-studded skies. 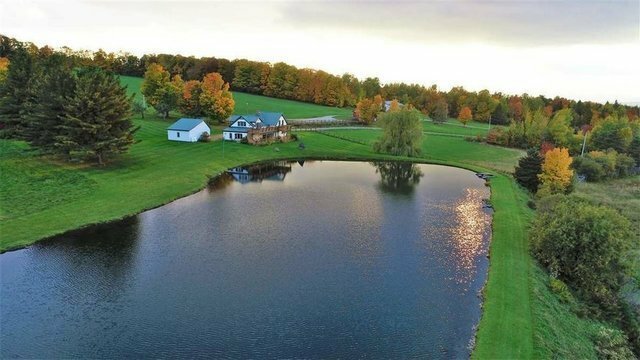 This truly unique property consists of 12 separate parcels & includes 2 homes, a shop & horse barn, pond, streams, brooks, gorgeous hayfields, woods, pastureland & miles of interior roads. Ideal for hemp! The house, which overlooks a 1.5-acre spring-fed pond, has had numerous recent upgrades including granite countertops; bath with claw-foot tub, separate shower & sauna; & modern paint colors adding personality. Friends or hired-hands can utilize the guest house located 1/2-mile from the main house. The shop includes 40x40 heated space with a compressor and electric hoist, heated office, storage, 3/4-bath, & 40x40 cold storage area prefect for tractors, RVs, boats & more. The 56x82 horse barn includes 12 stalls, all with rubber mats, as well as 20x20 office or tack room with 3/4-bath. This property has about 2 miles of road frontage - 1 mile on Hudson Rd, frontage on both sides of Mount Bess Road, which is maintained by the town, plus frontage on Rte 5A. The land is comprised of about 350 acres of crop and pastureland with the remainder being wooded. Enjoy nature walks, snowshoeing, Nordic skiing, ATVing, snowmobiling, hunting, fishing, horseback riding, & much more without leaving the property. Can be purchased with 732A for $1,690,000 (see #4675602). Terms considered to qualified Buyers. Broker Owned.